The General Director of Minsk Tractor Works stopped by Boyle Tractor in Fenwick recently to check out a restored 1984 Belarus 820. Pictured: Alexander Kazakevitch- MTZ Belarus Sales Manager, Olga Valuyevich- MTZ Belarus Marketing Manager, Brian Thiessen- Proprietor Boyle Tractor Ltd, Fiodar Damatsenka- MTZ Belarus General Manager, Dave McHenry- tractor owner, Alexander Zevin- MTZ Canada President, Arie Prilik- MTZ Canada Sales & Marketing. When Dave McHenry first decided to purchase and restore a 1984 Belarus 820, he didn’t expect it would garner much attention. But what started as an amusing diversion culminated in a visit from Fiodar Damatsenka, the General Director of Minsk Tractor Works (MTZ) in Belarus. 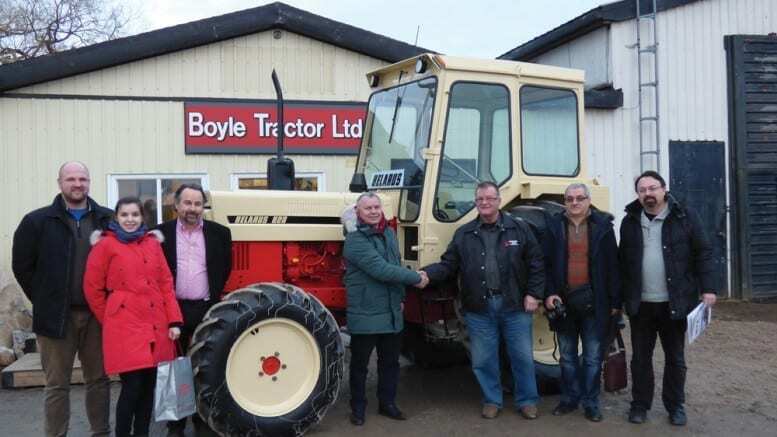 Damatsenka had been visiting distributors in North America, and when he heard that Boyle Tractor Ltd. had restored the Belarus 820 for McHenry, he made a point of stopping in to the Fenwick shop to see it for himself. “It was a lucky coincidence,” he said through an interpreter, noting that it was nice to see someone putting so much effort into restoring one of their machines. McHenry had made the purchase because he liked the look of it, and thought it had some unique features that were unusual for typical Canadian equipment. Belarus tractors were first sold in North America in the 1970’s. They sold over 50,000 units from then until the fall of the Soviet Union, when sales were disrupted. Recently, MTZ began to once again sell tractors in the U.S and Canada, where sales and marketing representative Arie Prilik claims there is a market for “a working man’s tractor”. While agriculture, along with most other industries, is becoming more and more reliant on computers and programmable equipment, Prilik argues that a certain percentage of the population does not need that level of sophistication, and prefers a simpler machine. Having no computers also means that farmers can avoid the dynamic legal issues that have developed around equipment software “If you can remove this stuff you can give ownership back to the farmer,” he said. Though McHenry’s tractor is not quite fully restored, he doesn’t expect to have any shortage of use for it. And if anything goes wrong, he should be able to fix it with just a screwdriver and a wrench.